From a climate perspective, the pipeline would be a disaster. Prime Minister Justin Trudeau, who was elected saying he would act on climate change, and who turned up at COP21 in Paris in December 2015 saying “how can we help?”, said initially he would only accept one pipeline. He has already accepted three. Part of the pipeline is intended to pass through the French-speaking state of Quebec, an independent-minded place, and although it still only at the planning stage, already in Quebec it has encountered a very unusual form of resistance. Beer. In Quebec there is a big movement to stop the pipeline. There have already been two demonstrations, with over 25,000 people on each. At the moment the pipeline is on hold. The story of the citizen movement that has arisen in opposition to it is fascinating. A while ago in Canada there was a massive student riot about tuition fees that lasted many months. One of their leaders wrote a book about the experience which won a $25,000 prize from the government. He declined to accept it, but instead he contacted the citizens behind the campaign Coule Pas Chez Nous, a campaigning organisation who had mobilised to oppose the pipeline. Coule Pas Chez Nous means something like “Don’t Spill in My Home (as in my back yard, my country, my environment)”. He said “I’d like to give this to you, but let’s see if we can ask the population to double it”. He went on a mainstream TV programme to tell his story, and in one week, had raised more than $400,000 from more than 12,000 donors! TransCanada are trying to push the pipeline through, but didn’t even translate their application into French, something they have to do by Canadian law. Students, unions, First Nations peoples and many more have come together to resist the pipeline. Marie-Eve Leclerc is one of the citizens involved in Coule Pas Chez Nous (now an organisation). One day she gave a talk about the story of the resistance movement and afterwards drank a beer whose label spoke about how it was designed to raise money for endangered species. The idea came to her for a beer that opposed the pipeline, exposed the risks to drinking water, and brought together many of the craft brewers in the province. She spent some time discussing the idea with friends, who all loved it, and then presented the project to the Coule Pas Chez Nous Foundation, who decided to make it happen. It was designed to raise awareness about the pipeline, to show that, unlike the promotions being put out by TransCanada, actually not all businesses were pro-pipeline, as well as raising some money for the campaign. Marie-Eve went to see a lot of different breweries, who were all very enthusiastic about the idea. A “beer for our rivers” was on it’s way! One of the brewers suggested the tag line “No water, no beer. No beer, no fun”, which was as silly as it was sending a powerful and clear message. To our knowledge, it was the first time in the world that breweries came together in opposition to a pipeline. Map showing the route of the proposed pipeline, as well as the location of the different breweries involved in the campaign. She went to meet one of the key microbreweries who loved the idea and who said “love it, let’s do 12,000 bottles”. That was a fair bit more than Marie-Eve had been expecting to do! The first batch of bottles and casks was launched in March, and the entire batch, both in bottles and in casks at bars, sold out in just 3 weeks. The beer was launched in every one of the breweries who signed up to be part of it, and each launch was so popular that many sold out of beer half way through the launch event. The recipe was created collaboratively by 5 breweries, each of which brewed its own version in different batches. The launch was accompanied by posters, tshirts and beer mats. Every drink sold made $1 for the Foundation. The launch was a huge hit. The story went across Canada. It was on the radio, and the launch date was chosen to co-incide with the month of St Patrick’s Day, River Day and Water Day, with organised events on each of those days. By the time of the third brew, 26 breweries across Quebec, mostly along the proposed route of the pipeline, were involved. Each of the 4 breweries who did bottled and cans did their own version created something which, in spite of using the same recipe, tasted different. As Marie-Eve put it, “it’s like asking different people to make a chocolate cake. Even with the same recipe, each cake will taste different. Different oven, different baker. It was the same with the beer”. To change from being a campaigning organisation to being a beer promotion organisation took a lot of work for the Foundation. But it was worth the (volunteer) work, as more than $15,000 was raised to keep up the fight! 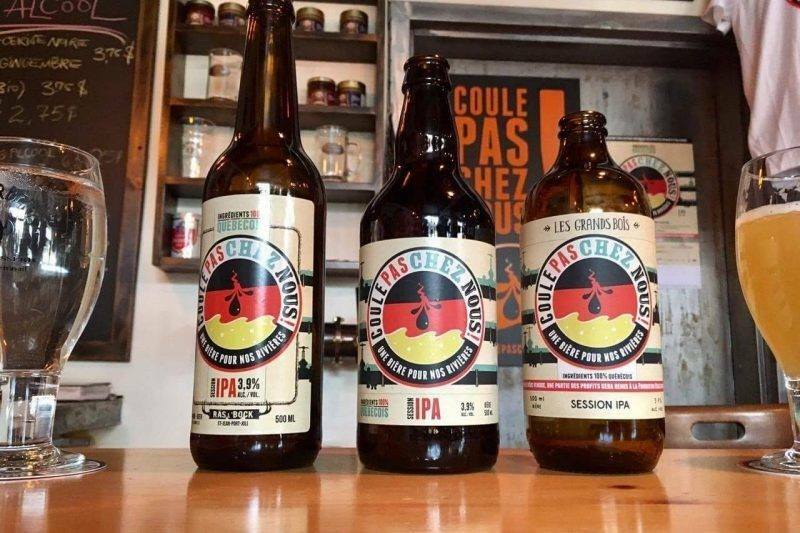 The second and third batch were sold through stores and bars across Quebec. The Foundation sent a slab (12 bottles) to each political party, and even tracked down the offices of TransCanada and paid them an unexpected visit to take them a bottle to enjoy, accompanied by a note to say “This is a beer for our rivers. We hope you enjoy it. The citizens don’t want your pipeline, they want clean water”. They ended up meeting the CEO, who was already aware of their campaign, and who offered them coffee! Their next project was similarly ingenious. They printed 800,000 stickers showing a duck covered in oil, and distributed them inviting people to put them onto the $1 bank bills (emblem on the $1 is a duck) they spend, so they show up on more and more bank notes. What an imaginative way to get a message out! All the breweries involved put them on the notes they give out in change. For Marie-Eve, there is something very powerful about a lateral approach like this beer project. “It’s not a project that talks about climate change”, she told me. “It’s about water. And fun. It’s about having a beer for a cause, and it reaches into wider networks. One old man I met (and he was not sensitive to environmental issues) said “they can’t touch my beer!”, which for me was a great sign that we were doing it right”. It is so good to know these heart warming and awareness raising stories and the people behind them. They are sparks of hope, catalysts, in an awakening people.